WTI crude oil is back above $60/bbl today, thanks to an EIA inventory report that underperformed expected stock builds and a declining dollar. Yesterday saw prices rise by over $1.60 (2.8%), reversing early morning losses. Although prices are trending slightly lower today, the reversal shows there is support to keep prices elevated in the $60/bbl range. WTI crude is currently trading at $$60.41, a small decline of 19 cents. Refined fuels enjoyed similar huge gains. Diesel prices soared five cents (2.9%), and gasoline prices picked up almost four cents (2.4%). Today gasoline prices remain strong, treading in positive territory to stay at $1.7141. Diesel prices have given up some of yesterday’s gains, trading 1.6 cents (-0.9%) lower at $1.8681. 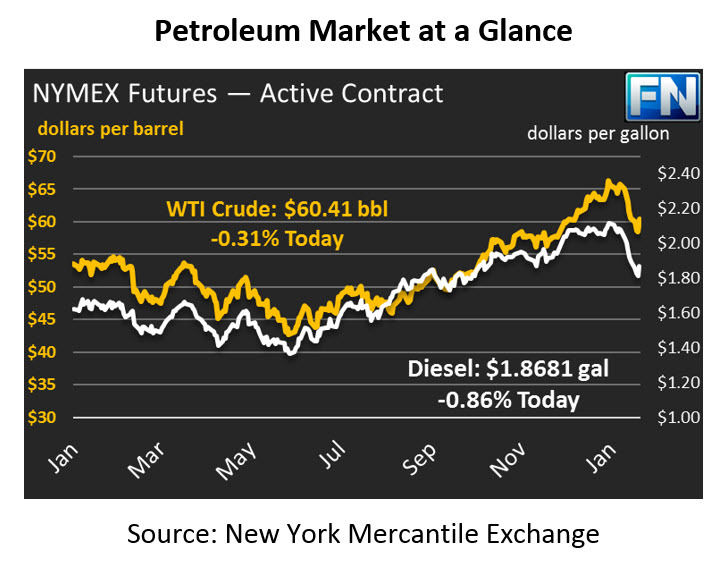 The EIA’s report yesterday gave markets support yesterday, with crude and diesel stocks underperforming market expectations. In addition, inventories at Cushing, OK (the delivery point for WTI crude) fell by 3.6 million barrels (MMbbls). All NYMEX WTI crude prices are driven by supply and demand in Cushing, OK – when Cushing supplies fall, it props up WTI prices relative to other indexes such as Brent. In addition to falling stocks overall, the EIA report showed that refinery utilization is winding down as we move into refinery maintenance season. Overall refinery utilization fell from 92.5% to 89.8% this week, with several Gulf Coast refineries off line. Crude imports and exports held fairly steady, though both gasoline and diesel saw large declines in import and export activity. The Trump Administration hinted recently at a 25-cent gasoline and diesel tax hike to fund Trump’s infrastructure bill. Proceeds from the tax rate increase would fund the Highway Trust Fund to repair roads throughout the country. This isn’t the first time Trump has mentioned the idea – in January, Trump indicated that every option is on the table to pay for his infrastructure plans, including an increase to a 50-cent fuel tax. While the tax hike would significantly increase consumer costs, it would not be unprecedented. Diesel taxes in the U.S. are 24.4 cents per gallon currently, while gasoline taxes are 18.4 cents; these numbers have not changed in years, making them a prime target for increases. The U.S. has some of the lowest fuel taxes in the world, as well as the lowest taxes among OECD nations. Check out our in-depth analysis on tax rates from 2017.